The above info came from atomofish, and was edited by yours truly (contact me). The image came from The Goddess Project. Ah! 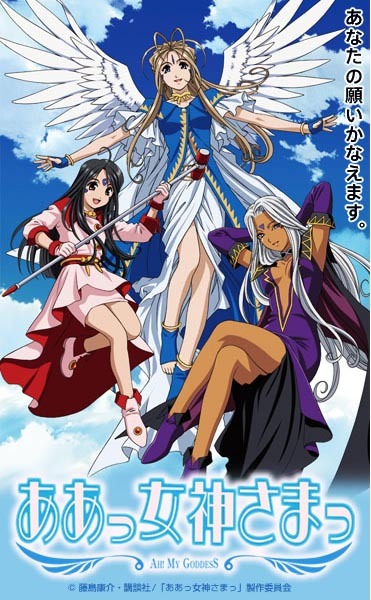 My Goddess: The Movie Gekijouban Aa! Megamisama! In this TV Series retelling of the popular Ah! My Goddess saga, we are once again introduced to hapless college student Keiichi Morisato. He doesn't seem to have much luck with anything, especially his love life. However, all that changes when he accidently makes a phone call to the "Goddess Help Line" and summons a beautiful goddess named Belldandy, who asks Keiichi for a single wish. Shocked and in disbelief that a Goddess would appear before him, he finally makes his wish. And of course, he wishes that Belldandy would stay with him forever. (In which the contract is enforced by the "Ultimate Force.") Now, Keiichi and Belldandy become a couple (although Keiichi has his fair share of problems expressing his feelings to a goddess) and Belldandy learns to deal with life on Earth and while keeping her true identity a secret. 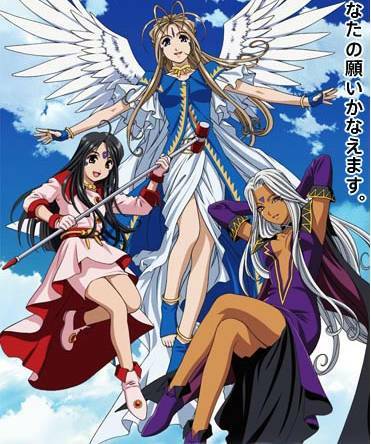 Eventually, Belldandy is joined by her two sisters Urd and Skuld (and a few other surprises as well).